I think we all find our own way to give back to the world. I'm sure lots of us have a particular charity or organization that we like to support. A few years ago I found mine. Chemo Angels is an organization that offers support to people with cancer. Patients worldwide can register for free with the organization, and then they are given two buddies, or angels, for the duration of their chemotherapy treatments. Each week, the angel/buddy volunteers send letters, notes of encouragement, or even small gifts to their patient during this difficult time. There are a two main ways to be involved. Chemo Angels send a small gift each week to their patient. Card Angels send a card or two each week to their patient, and also maybe a small gift from time to time. Angels don't expect to hear back from their patients. This is not a penpal program, which is good because I don't really have time for a full-on penpal, but I do have time to send a little light and love someone's way. Your commitment is over once your patient graduates from the program by finishing their treatments or, in some cases, when they pass away. I have been a Card Angel for a couple of years now. It's not always easy. The chemo buddy I had last year passed away. In my monthly update from the organization, I had found out that her cancer was spreading. Over the last few months her updates said she was having more bad days than good. What do you write to someone who is dying? She was mom just a few years older than me with young girls at home. My challenge was to send her something that would make her smile when she opened my letter. When I was sent the message about her death, her husband told us that she kept every letter and note in a scrapbook. That being said, there are so many wonderful things about being a Card Angel. I love when I get an unexpected letter from my chemo patient. I really love hearing they've graduated from the program and finished their treatments. Sometimes the patient, a family member or friend will write directly to the organization and express their gratitude and these messages are forwarded to the Angels. It is so wonderful to hear how full their hearts are of gratitude after something that really was easy for me to do. I also enjoy looking for little treats that I can include in my cards such as bookmarks, tea, stickers, gift tags, inspirational quotations, etc. It really is a great excuse to buy beautiful stationery, which I love to do. I have my eye on these beautiful cards right now. 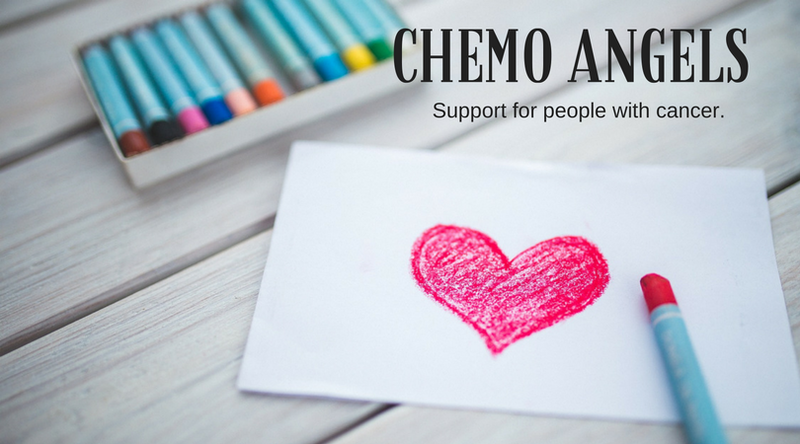 There is also an active Facebook group for Chemo/Card Angels. The members in this group are constantly sharing ideas, answering questions, and offering support when needed. Below is a picture of what I'm sending my chemo patient this week. Another branch of the organization is called Senior Angels. These angels offer support to seniors who may be house-bound or have less family contact available to them. Senior Angels are there to let their buddy know that they are remembered and that there are still people who care for them. More information about the Senior Angel program is available here. If you'd like to volunteer as a Chemo Angel or Card Angel, you can find the application here. If you know of a cancer patient who would benefit from this program, you can find that application here.